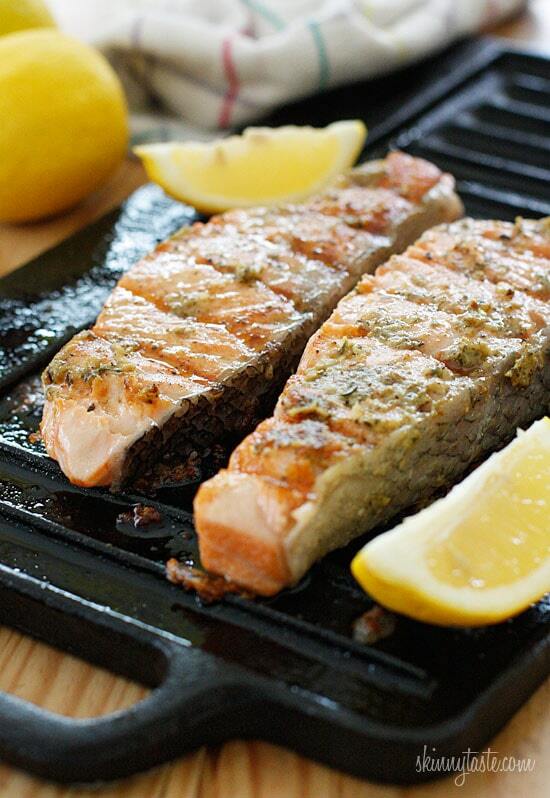 Salmon fillets seasoned with a garlic, Dijon herb sauce and served with a squeeze of fresh lemon… delicious!! Happy Wednesday! 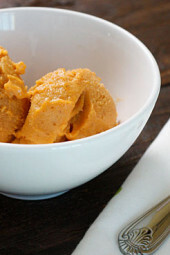 I’m busy as a bee, working on my cookbook so I wanted to share a recipe from the archives. 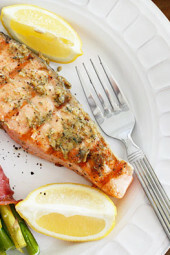 Salmon is one of my favorite fish dishes to make, and this is a fabulous way to prepare it! 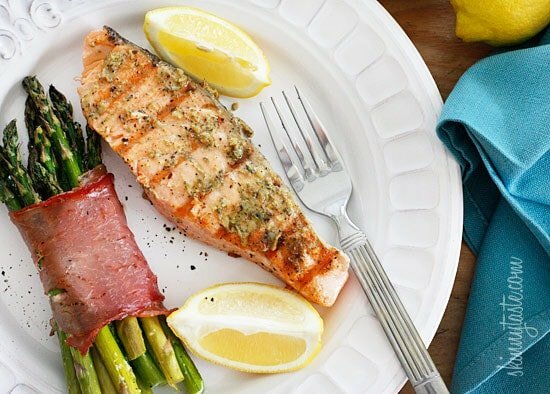 Salmon is a fatty fish, rich in heart-healthy omega-3 fatty acids, protein, and vitamin A. When buying salmon, I prefer to go to my local fish store rather than the supermarket and try to look for wild Alaskan salmon, a sustainable fish that lives in pristine waters and consumes a diverse, healthy diet. It’s available frozen year round. I used a cast iron grill pan to make this but an outdoor grill works just the same, be sure the grates are clean and oiled to prevent sticking. If you don’t own a grill, this can also be made in the broiler of your oven adding the mustard sauce during the last minute of cooking. In a mini food processor, or using a mortar and pestle mash garlic with the herbs, vinegar, oil, and Dijon mustard until it becomes a paste. Set aside. Season salmon with a pinch of salt and fresh pepper. 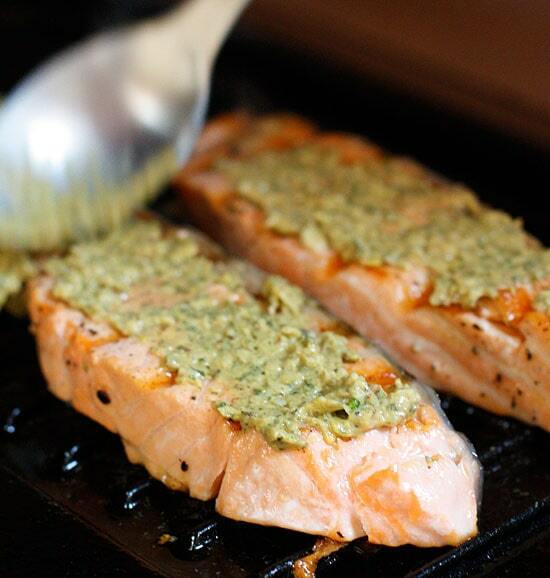 Heat a grill or grill pan over high heat until hot. Spray the pan lightly with oil and reduce the heat to medium-low. 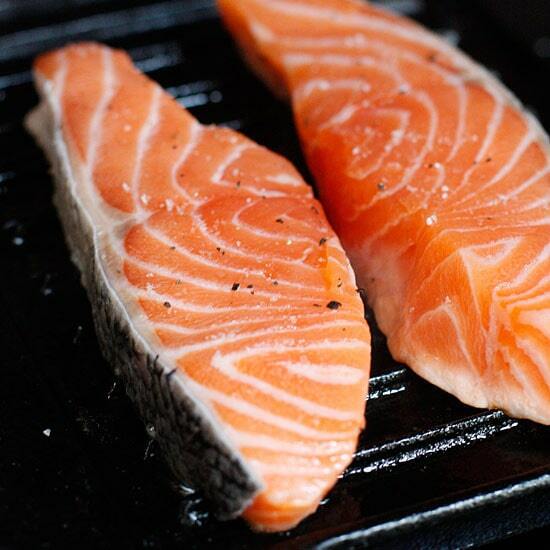 Place the salmon on the hot grill pan and cook without moving for 5 minutes. Turn and cook the other side for an additional 3-4 minutes spooning on half of the garlic herb mustard sauce. Turn and cook 1 more minute spooning the other side of the fish with remaining sauce. Turn once again and let the fish finish cooking about one more minute. **Note: the fish should have a total cooking time of about 9-10 minutes per inch. 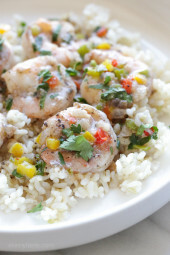 If your fish is thinner, reduce the total cooking time. Transfer the fillets to plates and serve with fresh lemon wedges. 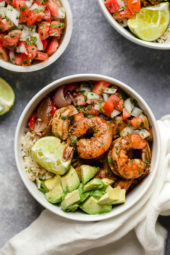 Has anyone tried this with chicken? My family aren’t big fish eaters so trying to figure out if I could just substitute chicken instead of the salmon. Excellent flavor. Did the method mentioned of just doing a broil, didn’t take long at all 4-5 minutes ( thinner salmon filet) and then added the topping for another minute or so, Great! Did the asparagus with it also and some spiral zucchini with grape tomato, and some greens, plus chopped herb. . Pretty plate. Had the blueberry slump from your cookbook for dessert. Perfect!